British writer John Carlin, author of “Playing the Enemy”[from which the film “Invictus” was based on], conducted a written interview with Arnaldo Otegi, who is being held at the prison of Navalcarnero. Question: Are you speaking for yourself or as a leader of the Basque Left ? Answer: I am responding to these questions from a Spanish prison as a member of the leadership of the Basque Left and so I am giving you my positions in accordance with the conclusions of our internal debate and the obligations we now have with the international community as well as different political, social and labor groups in the Basque Country. Q. Why have you always justified the terrorist violence of ETA ? A. My position and that of the Basque Left as a whole, has been the logical consequence of understanding that the existence and persistence of political violence in our country is due to reasons of a strictly political nature. Without wanting to outline any parallels in absolute terms, our position has been very similar to that maintained for decades by Sinn Fein in Ireland and Nelson Mandela in South Africa. What has characterized our position about this theme has been the insistence on the necessity of a definitive end to violence and political conflict through dialogue and negotiation. Our obligation has always been, and is, sincere; weapons, all weapons must completely disappear from the Basque political equation. Q. Do you reject the extortions of businesspersons, the so-called revolutionary tax? A. They are acts that must disappear. Every threat and persecution for political reasons, every denial of rights must disappear. To this end, no one can be indifferent or not feel questioned. Myself included. Q. Do you think killing a Civil Guard or a town council member is the way to achieve independence for the Basque Country (Euskal Herria)? A. There is no other path towards independence than that which is developed through peaceful and democratic means. We do not believe that the strategy for independence is compatible with resorting to armed violence. This is one of the conclusions that we have reached and we express it without any ambiguity. That said, I hope and wish that the Spanish people, their public powers, their social agents, politicians, their Government can categorically accept that using force, torture, the banning of [political] parties, closing media outlets… cannot and must not form part of their strategy in trying to impede the project for independence. Q. If ETA kills tomorrow, will you condemn it? And the rest of Batasuna? A. You are presenting me with a hypothesis that I consider impossible or highly unlikely since ETA has announced the end of their armed actions; but I don’t want to evade the question. If such a thing were to occur, the Basque Left, by way of their own reflection and agreements we have acquired with the international community and in applying the Mitchell Principles, we will oppose such actions. When the Basque Left distanced itself from alleged acts of Kale Borroka clearly shows our obligation to peaceful and democratic ways. Q. Why couldn’t this point have been reached three, four, five years ago? A. Maintaining a position of permanent self-criticism about our strategy is one of the signs of our identity as a political organization. Our current positions are the product of a long process of maturing politically that hasn’t been, or isn’t, free of complications. The change demonstrates our large social base, which has known how to do things in extreme conditions and without renouncing any of what we have been and what we are, our principles and our objectives. If this change had been possible or not four or five years ago can be an object of diverse interpretations, what is important is what has happened in spite of powerful agents of the state that have tried to impede it through repression; our imprisonment doesn’t have any other objective. Well, fine, they haven’t gotten what they wanted. Q. Don’t you think that the easiest way to end what you call the “Basque Conflict” is for ETA to stop killing and lay down their weapons? A. What you call the Basque Conflict came way before the birth of ETA. If ETA’s violence disappears, it doesn’t mean the end of the conflict between the Basque Country and the Spanish State. The definitive end of the armed struggle by ETA after 51 years will bring an end to the armed aspect of the conflict, but it will not resolve it. We propose a simple formula of democratic arithmetic for a definitive solution to the political conflict: the recognition of the Basque peoples’ national identity and their rights and respect so that the Basque people can freely decide their future peacefully and democratically, without any limit other than their own popular will. This formula would allow for a permanent and definitive end to the political conflict and, what’s more, it’s a formula that is even more extended, even in the European Union. The examples of Ireland, Scotland, Flanders, Montenegro, Greenland, the Faroe Islands… they all demonstrate the strength and timeliness of the Basque Lefts’ platform. Q. Why trust you or ETA after what happened in the T-4 and after so many failed ceasefires? A. In the first place I would like to manifest that we are receptive and respectful with those sectors who feel themselves “skeptical” about the sincerity of our positions and they do so in good faith., but we are especially critical with other sectors, especially the political class who use their skepticism as an alleged argument for maintaining absolutely unmovable positions because they feel comfortable with the current situation being blocked. Ok, we all have reasons for not trusting our adversaries, for not trusting their present or future intentions. But we need to go forward. Confronting this reality of multiple mistrusts, we have adopted a position from the beginning that allows us to move forward: to make decisions and develop them unilaterally; placing our people and the international community as the only guarantees in the evolution of a democratic process. In this phase the democratic process does not depend on the existence of previous agreements, not the confidence of a specific government. We have completely outgrown that outlook. It’s evident that in more advanced phases the process will require accords, agreements and dynamics of a multilateral character, but we will only reach this phase if we are capable of generating the necessary conditions from mobilizing society, the complicity of the international community for a democratic solution and bringing about unilateral gestures and acts. Q. Are you one who believes that ETA’s armed struggle has no future? When did you come to that conclusion? A. I would like to answer that from two different spheres. In the first place, if we speak of the future in strictly operative terms, I believe that ETA could continue prolonging its armed activity, with a higher or lower intensity for many years, even maintaining a certain level of social support. This organization has demonstrated for over 50 years that it is capable of regenerating itself and keeping itself operative in spite of the repression that has been used against it. We are not dealing with an organization that has been defeated by law enforcement. However, in the political sphere, and it is a global phenomenon, you can clearly see the transition of a great majority of the political-military organizations with a transforming and socialist identity, from insurgent positions to positions that are transformative and with popular, democratic strategies. Bolivia, El Salvador, Nicaragua and Uruguay are good examples of what I am talking about. I definitely believe that an efficient strategy for achieving our objectives should rest exclusively on our capacity for democratic seduction. Therefore, the Basque Left, considering geopolitical, economic and social variables and, primarily, analyzing the Basque political process it has been absorbed and put down in black and white in our document for conclusions. It’s not important to know when I came to that conclusion, what is relevant towards the future is that our base has overwhelmingly made it theirs in the debate that we just had. Q. Do you share Eguiguren’s idea that it is easier for ETA and the Basque left to renounce violence by themselves than because of a negotiation? A. I don’t know the details of the thesis that you mention so it would be foolish on my part to state any opinion about that. Q. What has changed your perception since your speech in Anoeta about overcoming violence? A. My convictions are more solid today than they were then. Believe me as I say this with complete and total certainty: if the debate that we just held would have taken place before the Declaration of Anoeta, it is very possible that the previous Peace Process wouldn’t have been halted. Q. Do you think that ETA will ever stop killing without any political concessions involved? A. Since the Declaration of Lizarra-Garai , and with more clarity since the Declaration of Anoeta –which has come to be accepted by ETA in their first interview- the place for negotiation and political agreements corresponds exclusively to political formations. It’s up to ETA to reach agreements regarding the consequences of the conflict: prisoners, victims, demilitarization. The decision for a temporary or permanent end to the armed struggle shouldn’t and can’t be subject to the existence of agreements of a political nature among political forces. Although it is evident that an inclusive climate for dialogue, together with applying perfectly legal acts (freeing sick prisoners and those who have completed their sentences), there is no doubt that it would aid ETA’s decision making. Q. Are you pressuring ETA for it to declare a definitive and irreversible end to violence? A. You have to believe me when I say that ETA is not an organization that makes decisions based on how much pressure is being applied to it. In any case, I can confirm that we have been using our political ideas to influence the decisions that would permit the opening of a new phase with the disappearance of political violence and the consolidation of a new space for dialogue and negotiation towards a definitive solution. Q. After the failure of the previous process, the current Government feels it is impossible to reopen negotiations if there isn’t a previous complete abandonment of violence. Do you see any alternative? A. I believe that using the final scenario as a starting point won’t allow us to go forward. I believe, nonetheless, that this petition can be a motive for the frustrations of previous processes. In this sense, I believe that the guarantee for surpassing all of the grave errors already committed –by everyone- could be found in agreeing with the Mitchell Principles and an adequate monitoring of the entire peace process by international figures that have the confidence of all sides. Q. The democratic parties consider ETA’s announced truce to be insufficient. Do you agree? Why? A. As time passes you’ll see that the homogeneity they make so much of isn’t quite so. This even more evident in the Basque Country where anyone who speaks of a homogenous position is really referring to what the PSOE and PP maintain. The position of these parties, with the calculated complicity of the PNV, reminds me of the tactic of the ostrich. They have to deny any change in our positions because if they did not then they would be forced to change their own and that would give them a lot of vertigo and shows their enormous political weakness. To sum up, I’d say that the risk of the reactions caused by the initiatives of the Basque Left and the move that ETA has made, we could reformulate Archimedes Point in political terms: the degree of irritation and skepticism regarding the new situation is directly proportional to the interest in maintaining the current situation inflexible. Q. What could have changed in the current leadership of ETA to make it different from others that have also talked of truces and ended up killing? A. Fundamentally in that there is a mandate from the base of the Basque Left that doesn’t admit any ambiguity and must be recognized. Q. In their latest communiqué, ETA suggests that they are willing to sit down and analyze the situation with the signatories of the Brussels Declaration , but they themselves don’t even accept the contents. Don’t you think that is insufficient? A. That corresponds to the signatories of said Declaration to make the pertinent appraisals as to what was said by ETA, and I want to emphasize that they have shown their disposition to create an “International Contact Group” in relation to a possible process of dialogue and negotiation. In this sense, I am convinced that they act, and will act, with complete seriousness, honesty and impartiality. Q. What would you say right now if you had the leadership of ETA in front of you? A. That, being coherent with the unilateral character of this phase of the process, and echoing the Brussels Declaration as that being subscribed to by the whole of the organizations of the Basque Left with other political, social and labor forces, that they declare a unilateral, permanent cease-fire, verified by the international community. Q. What is the definitive calendar that you can predict now for ETA? And for the Basque Left? A. We are at the beginning of the journey. The objectives in this first phase for us are parallel to the progressive articulation of a pro-independence space and are gathered in the Declaration of Gernika , which consists in reaching a non-violent climate with guarantees and a political normalization that progresses, that permits the process to enter into a phase of dialogue and towards political agreements. Q. Do you think it is possible for ETA prisoners with a pending sentence can get out of prison before the total abandonment of the armed struggle? A. In the first place, I would like to make clear that the Executive branch orchestrates the current juridical and incarceration strategy, absolutely and completely. 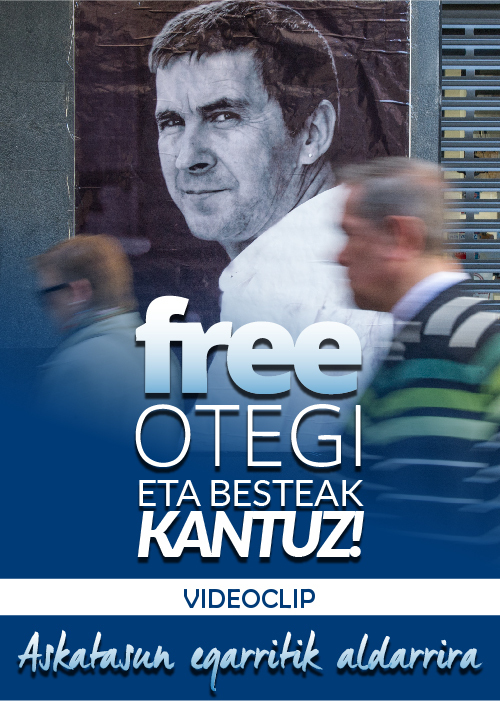 Just by strictly obeying the law, dozens of Basque political prisoners should be free. In politics, what we are subjugated to fits perfectly with the saying, “the end justifies the means.” I want to again ask for the freedom of all of my compatriots who are gravely ill, as well as those who serving their sentences. That said, I understand that the liberation of all the Basque political prisoners is only possible in an environment of a definitive end to the armed struggle by ETA and the conflict being directed toward paths of dialogue and political negotiation. Q. Are ETA’s prisoners considered a legitimate part of ETA, with a voice in the decision-making, by those who are still free? A. I am not a member of ETA. I can’t answer that question. Q. If ETA announces the definitive end to violence, what should be the future “exit” for the organization’s prisoners? Should there be differences between those with crimes of blood and those that do not? Which [differences]? A. The exit for all of the Basque political prisoners should be channeled in the context of the development of a process of dialogue and negotiation. It is premature to make a guess or try to introduce any nuances with respect to the current phase. In my opinion, however, any agreement the release of prisoners must be agreed upon by ETA and the government without delay. In this case I think it is reasonable that ETA, in their latest interview, they show their willingness to discuss this point with urgency and without conditioning it to the existence, or not, of political agreements of a definitive nature. The government should explore this disposition asking for the guarantees that they see fit, this would bring us closer to a solution, without a doubt. Q. Why should ETA’s victims accept that the murderers of their family members should get out of prison? A. We have always shown our respect for the families of the victims, that, I want to repeat, exist on all sides. Their opinions, their worries, their fears… they must be heard, attended to and be indemnified according to the capacity of our possibilities. From mutual recognition and respect, we must be capable, without ever forgetting, to construct a better future for the coming generations in the Basque Country as well as those in the Spanish State. Q. What would you say to the victims of the attacks that you have not condemned so that they say these words? A. I think that, in this moment, to try and gain the confidence of these people with words and gestures would not be a plausible objective. I would limit myself to show them the agreement we made in Guernica that mentions the “necessity of recognition, reconciliation and make amends for all victims”. This is the direction that we are willing to take if it becomes necessary. Q. What is ETA today, for you? How would you define it? A. Today, ETA is an organization that has suspended its armed actions, that is willing to declare a permanent and verifiable cease-fire, which shows that it has the will to completely overcoming violence and refusing any interference in the development of any conversations that take place between politicians as well as promising to respect any agreements reached. Q. Judicial rulings have referred to ETA as a conglomerate that includes Batasuna. What differences do you see between these groups, organizations or movements within the conglomerate? A. Not I, nor Batasuna, or any other organization of the Basque Left, form a part of any “conglomerate”. The theory of the “entourage” is nothing more than an invention by the police and courts to justify our arrests, illegalization, and imprisonment. So I am going to take advantage of this occasion to respond to the question that Mr. Rubalcaba always asks us about our choice between the ballot or the bullet. Our choice is with the ballot, mobilizing and organizing the people. What is his? It is really curious to see him, together with the PP, in their complete devotion to banning us through civil and criminal means to stop us from participating in elections and, that way, receive votes from the citizens. Q. What is the connection between the Basque Left and ETA? A. There are no organic connections if that is what you are referring to. Q. Leaders of the Basque Left assure us that there is no longer a direct middleman between ETA and the Basque Left. Is that true? When and why did this distancing, this separation, happen? A. The contemporary pro-independence left rose up during the Franco dictatorship as an anti-fascist and patriotic Basque organization. Where we coincide with ETA is limited exclusively to sharing strategic objectives: independence and socialism for the Basque Country. Q. What do you think of the “Kale Borroka” [“Street battle”] ? Do the leaders of the Basque Left have the capacity and authority to control it? A. A very high proportion of the acts attributed to the “Kale Borroka” in the past months have had an unknown origin, when they are not just very suspicious. These events have been used politically and by the media to attempt to deteriorate our political credibility and put in doubt the sincerity of our gamble. Also, these “acts” give political oxygen to the so-called “constitutionalists”, who, not having any solid arguments to oppose the opening of a new cycle they hold on to these acts like they are grasping at straws Independently of these considerations about recent events, and in response to your question, the position of the Basque Left is coherent with the political strategy we have adopted and, in this way, these acts do nothing but go outside of our strategy and the reflection that has been decided on by the base of the Basque Left, they go directly against it and therefore, they deserve all of our repudiation in political terms. Q. Do you think it is possible for a definitive rupture between ETA and the so-called Basque Left? Could ETA convert itself into a kind of Real IRA, dissident, marginalized and condemned by the rest of the Basque Left? A. I have the impression and am aware of powerful State sectors that are positioning themselves strongly for a situation that maintains armed violence – the lowest level possible- accompanied by our distancing ourselves completely from it, in spite of completely overcoming it. This is the Spanish version of the British “Securocrats”. The hypothesis of a “Real ETA” is highly improbable, if not impossible. We don’t see that happening and our effort is directed towards a just, stable and democratic overcoming of the conflict in its totality. Q. The new position of the Basque Left is seen as a simple tactical movement by the Basque Left to end its illegalization and be present in the elections. Why should anyone think any different? those who are really obsessed with the next elections are fundamentally –though there are others too- the PSOE and the PP, who consider our participation to be the foolproof test as to whether or not there are negotiations; the others as an exercise in showing “muscle” in front of the PP. Let me remind you that the only real reason for not legalizing us or for not allowing our presence in the elections is simply because, just by being present in the elections, would provoke the crumbling and fall of the virtual reality house of cards that has been constructed around the “change” in the Basque Autonomous Community . To put it simply, it would again make it clear that there exists a majority block in a key of Basque nationalism and self-determination. What’s more, our electoral force would again demonstrate the absolute falsity of the diatribes about an alleged weakness or even a political defeat. So you see, the ostrich wants to keep his head in the dirt. The Basque Left hasn’t renewed its wager thinking about the next elections, but the next generations. Q. If you don’t achieve legalization, are you destined to disappear? A. Absolutely not, and the biggest proof of that is that after all these years of persecution, arrests and illegalization; we are not only present but we are also marking the political agenda in a big way. Q. Shouldn’t you incorporate an explicit condemnation of ETA’s terrorist violence in your platform so as to be credible if you want to take part in the elections? A. First of all, I’d like to point out that our goal is to arrive at a situation where such a condemnation, or something similar, is no longer necessary because political violence has disappeared. That said, the Basque Left should require the same conditions and guarantees as any other political formation at the time of registering as a political party or movement. If it is not that way, we will continue to be victims of the arbitrary and antidemocratic application of authentic laws of exception. In this sense, as an anecdote, I will cite Eduardo Punset in his book “El Viaje al Poder de la Mente” where he shows his astonishment that certain political sectors in Spain keep demanding the democratic credentials of others, when they themselves have never been. Q. With your current perspective, what do you think of the “Law of [Political] Parties” and the ruling from Strasbourg? A: The Law of Parties was designed and elaborated ad hoc to neutralize the Basque Left and manipulate the democratic will of the Basque citizenry. We Basques occupy a unique geographical space in the European Union where the institutions do not reflect the popular will. The ruling from the Strasbourg –in in whose elaboration a Spanish jurist took part- is now being brandished by Turkey to ban Kurdish parties while the EU is demanding proof of an effective democratization for the Turkish regime to join the Union; or by the ultraorthodox, like Israeli Minister Lieberman who wants to prohibit Palestinians in Israel, an act that has been denounced by the international community. Q. Do you still think that it was the PNV, and not ETA, that were wrong back in 1977 in opting to participate in elections? Doesn’t the Basque Left have some self-criticism to do for continuing for years to deny the democratic character of the current political system? thesis that we supported in 77 and that the Basque Left has maintained for more than 30 years with a coherent institutional and mass-based activity. Regarding the “democratic” character of the Spanish political system, there is a lot there to debate and argue about. I’ll begin by making a “concession” to the Spanish political system; it is recognized and considered as such by the whole of the international community: it has been considered so by the Western democracies, there is no argument there. But, it’s not less true that it has many deficits in the way it is run. Do you believe, for example, that Spanish democracy could pass Montesquieu’s test about the separation of powers? Do you really believe that a country that appears every year on the UN’s official reports on the prevention of torture is really democratic? Do you believe that a system that allows the financial elite to dispose of our lives and homes without any democratic control over the financial system? Do you believe that a system that still maintains tens of thousands of bodies in ditches, murdered by Franco’s fascism, with fear or incapacity to recover the historical memory is a democratic system? I repeat that our position in this respect as socialist militants is extremely critical. However, I do believe that a second Transition in the Spanish State is inevitable. It could take some time, but it is impossible to avoid. We are prepared to be out front with a constructive spirit and with exclusively peaceful and democratic means. Q. In May of 2006, the Basque Left admitted three errors: the proposal for Navarre, leaving the impression that you wanted to impose your ideas and letting people think you are indifferent to the suffering of others. Do you think these errors are still being committed four years later? A. I think we have consolidated our political bases enough to overcome these errors and to guarantee that they never happen again, and that way provide efficiency and profundity to our political strategy. Q. Are your words in favor of a peaceful political solution to the Basque problem irreversible? A. Our position regarding a peaceful and democratic solution to the conflict are irreversible and we don’t contemplate any hypothetical circumstances that could make us vary our position. Q. What did you think when you first heard of the attack against the T-4? Did you call the negotiators at Loyola ? What did you say to them? A. The first thing I did was to try and find out if there were any personal losses as a consequence of the attack that disgracefully confirmed. Later on, I thought about the years of work to open the paths to solving the conflict through dialogue had been wasted again. I shared, I believe, with the Basque and Spanish societies the anguish and deception. That very morning I met with Jesus Eguiguren. We were both very upset with the news. I tried to convince him, in vain I believe, that we should do something to try and save the process and dialogue. I insisted that we shouldn’t throw in the towel and I promised to make some kind of gesture on our part. The following day, in a press conference, we demanded that ETA return to a permanent ceasefire. ETA accepted, but at this point, the level of mutual confidence that had cost us so much effort had been broken. Q. What was your role in the previous negotiation? A. I was the one that, on a personal level, initiated the informal contacts with different people close to the PSOE, and at that moment we didn’t even see the day when we could reach a scene of official, public dialogue and negotiation. Those contacts, which lasted years allowed us to be prepared for when the opportunity arose. In the conversations in Loyola and Geneva I was the head of the Basque Left delegation. Q. Now that time has passed, what do you think was the key to the breakdown of the process? A. There are different keys to understanding the failure (relative, in any case, given that, for example, our current position can’t be understood without taking into account the profound self-criticism that we have made around our position and attitude in the dialogue process), like the deteriorating confidences, the non-compliance of agreements –including my imprisonment, for example-, or the banning of demonstrations at the hands of the National Tribunal, that was not just a casual act. Y they have come around to repeating it now. However, the fundamental key is that the Government, and in a big way ETA, confronted the inherent difficulties in every dialogue process and negotiation with a scheme that moved around the thought that the threat of repression or the renewal of armed attacks was an efficient formula for changing the other side’s positions and unblocking the impasse at the time of reaching agreements. The scheme demonstrated that, far from resolving the impasse, it did nothing but create a larger impasse, deepening the differences instead of overcoming them. That scheme didn’t aid in going forward, and in our point of view, is a dated scheme that shouldn’t be used by either side. Q. What pending trials do you have? A. Earlier we spoke about the instrumentalization of the judicial system at the service of political strategies that are designed no Ferraz or Genoa . My colleagues and I are pieces used to demonstrate the “firmness” of the Government, on one side; or to sabotage the new situation (also an objective of the PP, which has a big influence among the judiciary). I will be tried soon at the National Tribunal, together with two colleagues, for presenting a peace proposal in Anoeta, accused of “glorifying terrorism”. And, we will be judged by, among others, the illustrious magistrate Enrique Lopez (spokesperson and member of the General Council of Judicial Power and a candidate for the Constitutional Tribunal proposed by the PP), so we know beforehand that we will be convicted. There are no “judicial” causes against us, just a political persecution disguised in legalese. Q. Have had any conversations in prison with leaders of the Socialists or by the central or local Government. If so, who?, when? and for what end? A. I haven’t had any meeting or communication of that nature. In any case, I can demonstrate to you my absolute disposition for dialogue and an encounter. At this time, I have a petition from a delegation of Eusko Alkartasuna to interview me, for which I have solicited the pertinent authorization. Q. How do you live in prison? What is your life like? A. My life in prison isn’t substantially different from any other Basque political prisoner. Sports, reading and studying make up a good part of my activity. I try to “take advantage” of my forced stay to, following the recommendations of Nelson Mandela, prepare myself and train myself even more from the perspective of continuing to contribute my grain of sand in the task of forging a socialist and pro-independence alternative for our country. Q. You are in prison and a majority considers you an extremist, incapable of contributing for peace or condemning the violent ones. Have you ever thought of abandoning politics, the public life? level don’t share that affirmation in any way. On the other hand, I have never thought of abandoning my political obligation that will accompany me until the end of my days. Q. Do you think you will return to democratic politics, and sit in the Basque Parliament sometime? A. I have no doubt, and let me give you a prediction: I will be sitting in the aisles of the majority group in congress, that of pro-independence leftists. That will happen much later then what we desire, but way before our adversaries want it. Q. What do you think of Patxi Lopez? A. Patxi Lopez is the lehendakari of the Basque Autonomous Community and he knows he doesn’t represent the social majority in this community. He is a prisoner of the PP and, partly, of the institutional position that he occupies. I want to send him a message: more than qualifying our moves as “insufficient”, they are brave and give something, as insufficient as it is; for example; tell your colleague Montilla that Euskal Herria is a nation and that it has the right to freely and democratically decide its own future. A. Jesus is a person very dedicated to searching for a just and democratic solution to the conflict. Above the many differences, after a long and intense relation that we have had, I feel esteem for him. When we find ourselves at the solution, those that criticize him in his own party and maintain a position of “champion hard-liners”, and those that are betting on a democratic exit, we’ll all sit down and chat over a good cup of coffee.